ALA contributes to the maintenance of normal blood cholesterol levels. Alpha- or α-lipoic acid, R- lipoic acid, or the initials ALA. Alpha-lipoic acid, also known as thiotic acid is synthesized to a certain extent in the liver and is a substance with vitamin-like properties that is essential for human beings. It is able to chemically bond with heavy metals such as lead, arsenic, mercury, nickel and cadmium, so that these substances can then be excreted by the body. Each vegetarian capsule contains 600mg of essential alpha-lipoic acid. Contents: 88g = 90 vegecaps containing 600mg each. The antioxidant alpha-lipoic acid is only produced by the body in minute quantities. We receive most of the alpha-lipoic acid we need through the foods we eat: Red meats, such as beef, and also organic meats are among the most important sources. 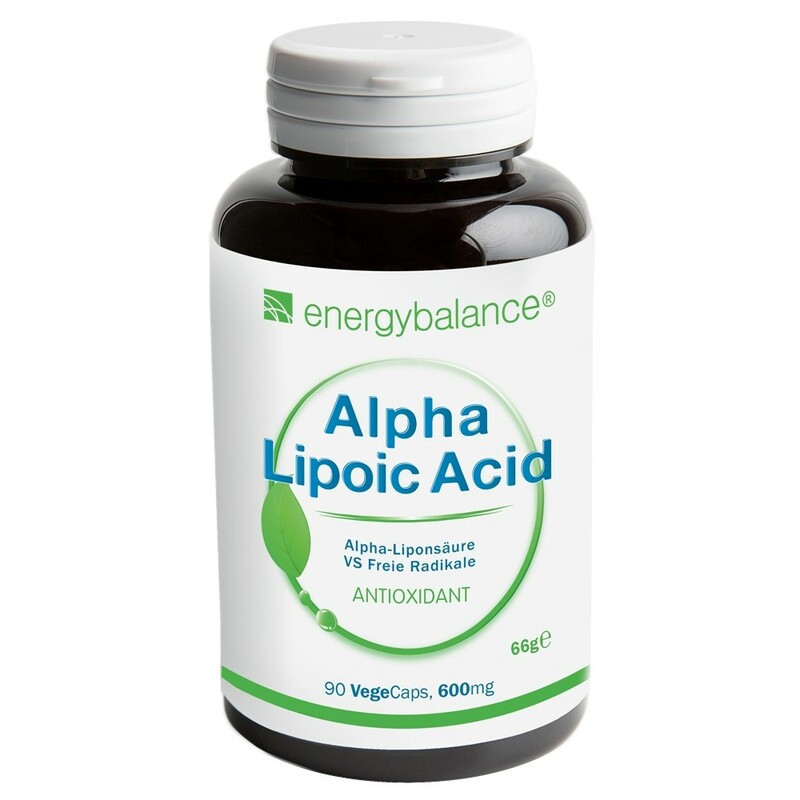 Alpha-lipoic acid is an antioxidant and helps the body to reduce oxidative stress. Alpha-lipoic acid counteracts free radicals and can support the formation of intracellular antioxidants (e.g. glutathione). Alpha-lipoic acid contributes to the metabolism of carbohydrates by improving blood glucose levels. The main reason for this is the fact that the body routinely converts alpha-lipoic acid into dihydrolipoic acid, an even more effective anti-oxidant, which is able to counteract the harmful effects peroxynitrite radicals. In addition, lipoic-acid, in the form of dihydrolipoic acid, is able to restore vitamin C, which in turn can form new vitamin E. Lipoic acid's multi-talented properties may contribute to its popularity among consumers – especially among athletes who want to optimize their energy metabolism. A less well-known reason also supports the use of lipoic acid as a dietary supplement: it compensates for a lack of red meat and animal fat, which athletes today often avoid. Red meat and animal fat are a rich source of lipoic acid. That is why lipoic acid is a very popular nutritional supplement among vegetarians and vegans. Lipoic acid is also noted for its supportive effect against the formation of cataracts. The water-soluble and anti-oxidative properties of lipoic acid lead to oxidative relief in the aqueous milieu of the eyes. Alpha-lipoic acid has a high redox potential, which is why it plays a key role in the body's anti-oxidative network. Alpha-lipoic acid is an effective sulphur-containing anti-oxidant. It helps to balance stress hormone levels, and supports the metabolic functions of the liver. Recent findings have shown that alpha-lipoic acid helps to retain a high basal metabolic rate (thermogenesis) and is thus important for the self-regulation of body weight. Alpha-lipoic acid works best in combination with other antioxidants. Adults 1 - 2 capsules daily with a meal. 66g = 90 vegecaps containing 600mg alpha-lipoic acid each.